…or The Prospect of Whitby, a Grade 2 listed public house on Wapping Wall ( turn east out of Wapping Overground, or DLR to Shadwell and an easy walk south ). If you haven’t been here, it’s worth a visit. 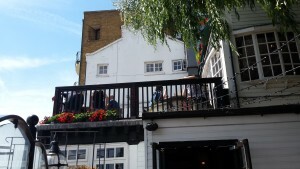 It claims to be the oldest riverside pub in London, dating back to the 1520s, when it was called The Pelican. Only the flagstones remain of that period, but there is much else which is of interest. It was renamed ‘The Prospect..’ following a fire in 19th century, after a Tyne collier which used to tie up near by. 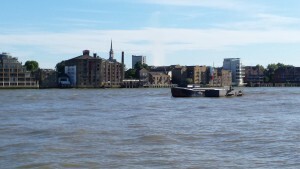 Intertwined with the history of sailing and the sea, as is all of this part of Thames-side east London, it was a notorious haunt of smugglers. It was also the base for the ill- fated expedition to discover the North East Passage to China, attempted by Sir Hugh Willoughby in the Bona Esperanza 1533. A Russian expedition discovered his body and those of his crew about a year later. In the 17th century it was a favoured tavern of Judge, Lord Jeffreys, the notorious ‘hanging judge’ responsible for the ‘bloody assizes’ after the Monmouth rebellion. Although Jeffreys has become something of a pantomime villain in the popular imagination, probably 200 people ( out of almost 1,400 found guilty of treason ) were executed, though the manner of the executions, including ‘burning by fire’, was harsh. He was said to frequent The Prospect to watch the slow demise of those prisoners, usually pirates, sentenced to death by drowning, who were affixed to posts in the mud at low tide. This practice supposedly took place at Execution Dock, the site of which was probably further around the river from The Prospect, closer to a tavern called The Town of Ramsgate, which was where Jeffreys was finally run to ground after the Glorious Revolution of 1688. 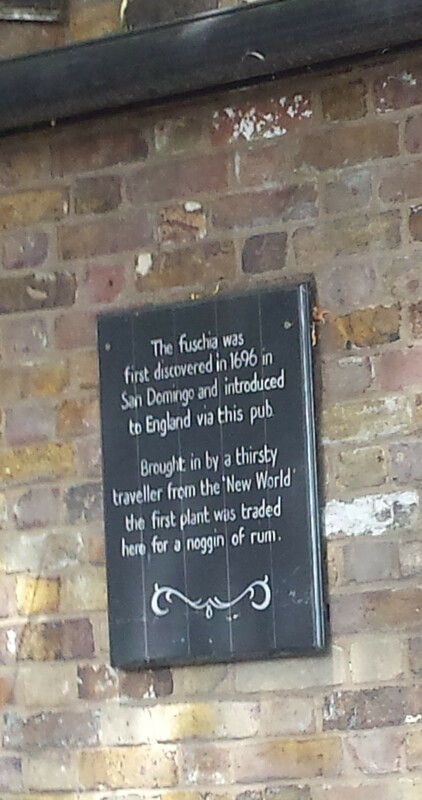 He ended his days in the Tower, but his penchant for riverside pubs ( one of his biographers referred to him as ‘an alcoholic’ ) is reflected in the claims of several hostelries hereabouts – such as The Angel (Kings Stairs, on the south bank), as well as The Prospect and The Town of Ramsgate. Also on the south bank and visible from The Prospect is another pub, now The Mayflower, formerly The Shippe, from whence the Pilgrim Fathers’ ship departed in 1620, en route for Plymouth to collect its passengers. 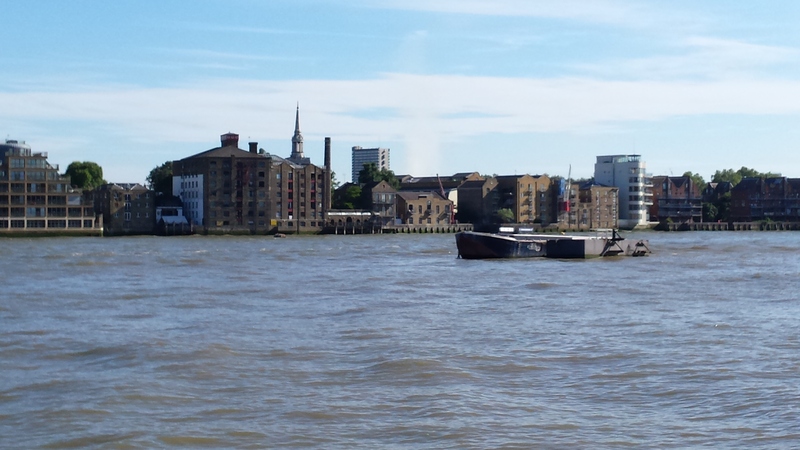 It is the small white and black building snuggling beside a large dockland warehouse in the photograph above right. 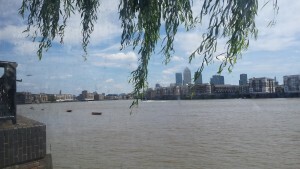 More sympathetic habitues of The Prospect include Samuel Pepys and Charles Dickens and the artists J.M.W.Turner and Rex Whistler, both of whom drew views of the river from The Prospect’s riverside balcony. On a sunny Sunday, however, it was The Prospect’s riverside garden which attracted. In it can be found a plaque to the first fuchsia introduced to Britain, brought ashore in 1696, apparently, by a sailor who traded it, illicitly, for his rum. A more grisly reminder of the inn’s past is the noose which hangs from the balcony, over the Thames. Although it was high tide when we visited, the waves lapping gently on the other side of the low garden wall, it is possible, at low tide, to walk along the ‘beach’ beneath the garden wall for quite a distance. 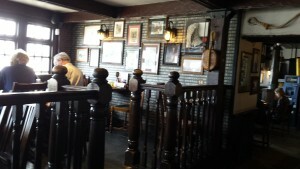 The Prospect is a Taylor-Walker pub which carries a range of guest beers. Hot and cold food is available, inside and out, although we didn’t dine, being committed to lunch elsewhere. You can find out more about it here. 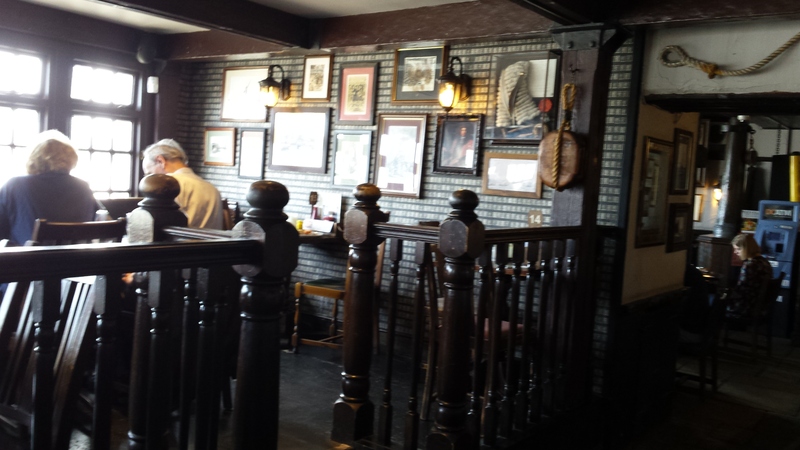 Visit to Hertford House Waterloo Easter doings….. 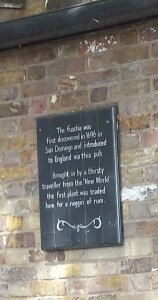 This entry was posted in History, London and tagged London, Worth a visit by juliej. Bookmark the permalink.